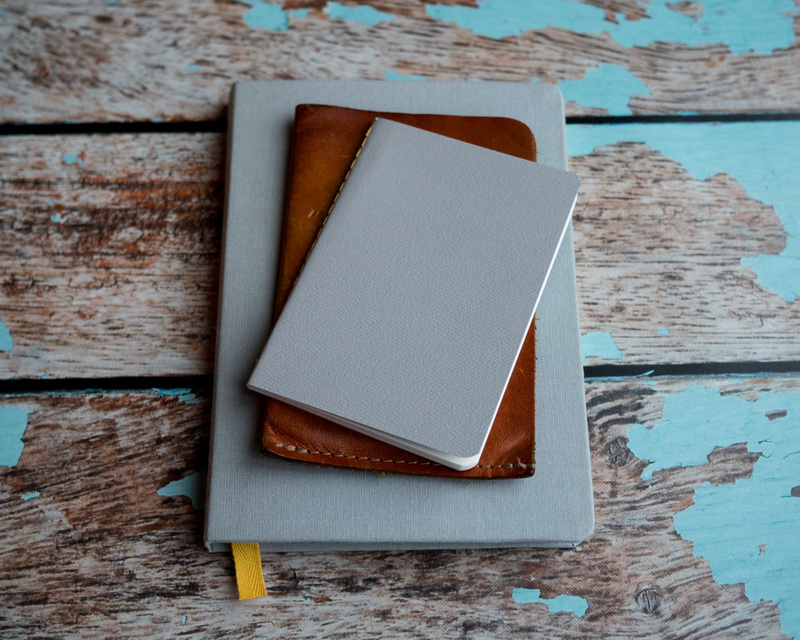 Baron Fig, creators of the well-regarded Confidant hardcover journal, recently launched the Apprentice, their take on the softcover pocket notebook. While I'm about neck deep in pocket notebooks right now, I couldn't wait to give the Apprentice a try for a couple of reasons. 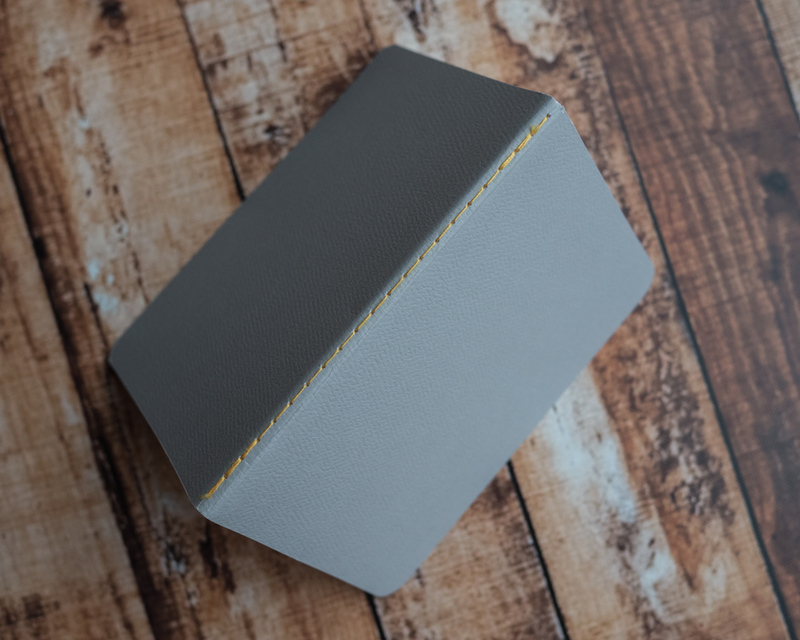 First off, the Baron Fig guys brought a unique approach to the hardcover journal category with the Confidant, and I was curious to see whether they could do something similar in the crowded pocket notebook segment. I've also had great luck using a variety of fountain pens and inks on the Baron Fig Confidant paper, and the word on the street was that the Apprentice would feature the same paper. Given how poorly Field Notes and many other pocket notebooks handle fountain pen ink, this prospect was quite appealing. The first thing that jumped out at me about the Apprentice is that it doesn't feel like a poor man's Field Notes. It has its own unique style and feel. One major difference is that it's not the de facto standard 3.5-inch by 5.5-inch pocket notebook size. It's 3.5 inches wide but only 5 inches long. It's nearly identical in size to my U.S. passport. It's clear to me that the Baron Fig folks put a significant amount of thought into dimensions. My experiences with the Confidant and Apprentice were very similar. In both cases, my first impression was, "Huh, this is smaller than what I'm used to." Then, after a couple of days of use, it shifted to, "Huh, this actually feels more 'right' than what I'm used to." Another distinctive attribute of the Apprentice is its sewn binding. It's a departure from the metal saddle stitch that holds most pocket notebooks together, and the yellow thread is a nice callback to the Confidant's trade mark yellow bookmark. 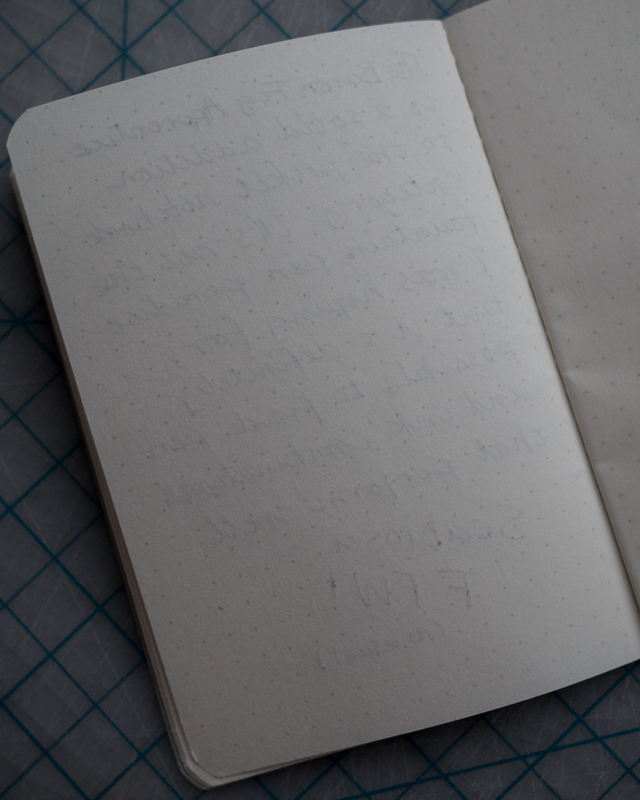 All in all, the Apprentice feels sturdier than most other pocket notebooks I've used. The grey textured cover stock looks nice and has some heft to it. The notebook pages do also appear to be the same 100 gsm paper featured in the Confidant. Collectively, the cover and weighty paper give the book a solid, premium feel. Once I saw the familiar Confidant paper in the Apprentice, my expectations skyrocketed. I immediately started throwing various fountain pens and inks at it. To my surprise, I was a little bit disappointed with the amount of bleed-through I was seeing. It felt like a step down from my experience with the Confidant, so I grabbed one of my Confidants and tested out the exact same pens and inks. Overall, front-side performance is generally comparable to the Confidant. There is a slight bit more feathering with the Apprentice, but it's hardly noticeable. Sure enough, however, the Apprentice does exhibit quite a bit more bleed-through than the Confidant. It's kind of strange, since it really does seem like the same paper. The amount of bleed is not terrible. It's just not flawless like the Confidant has been for me in most cases. The Apprentice is also still a big improvement over the bleed-through horrors I've encounter using fountain pens in Field Notes. 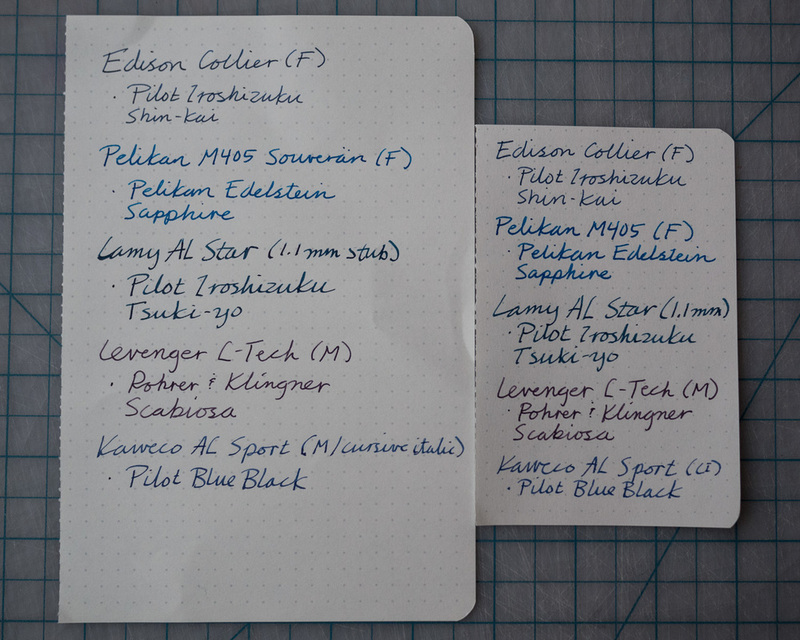 I also found that there are definitely some fountain pen and ink combinations that do just fine with the Apprentice's paper. So while it's not the fountain pen wonderland I was expecting, it's definitely a solid step up from most other pocket notebooks I've thrown fountain pens at. Once you find a compatible pen and ink combination, life with the Apprentice is pretty darn good. The Apprentice retails for USD $9.00 per three-pack, slightly less than the $9.95 Field Notes benchmark. Baron Fig also offers free shipping on orders over $15. 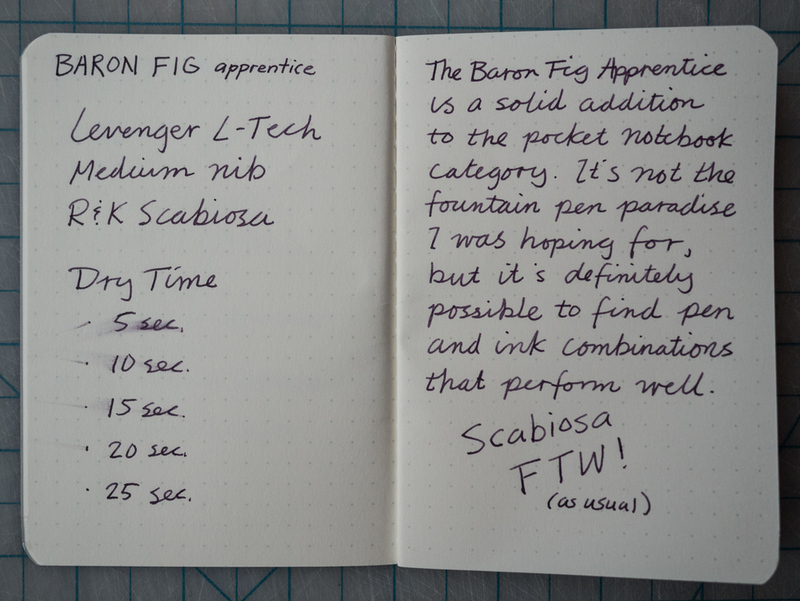 While I had high expectations for the Baron Fig Apprentice, the reality is that my needs are actually pretty simple. 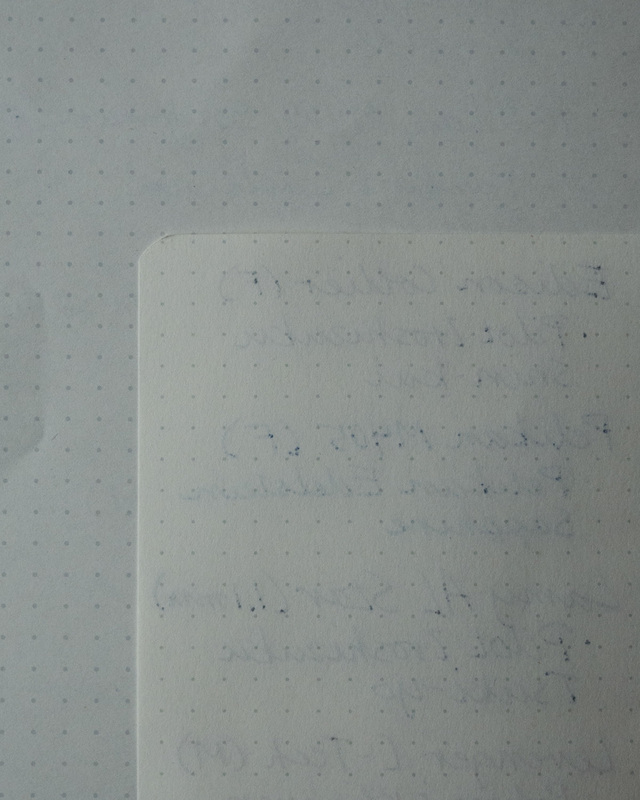 I just want to be able to use fountain pens with my pocket notebook with a minimal amount of feathering and bleed. I don't mind being limited to finer nibs and well-behaved inks. The Apprentice definitely hits that bar. It's my new pocket notebook of choice. 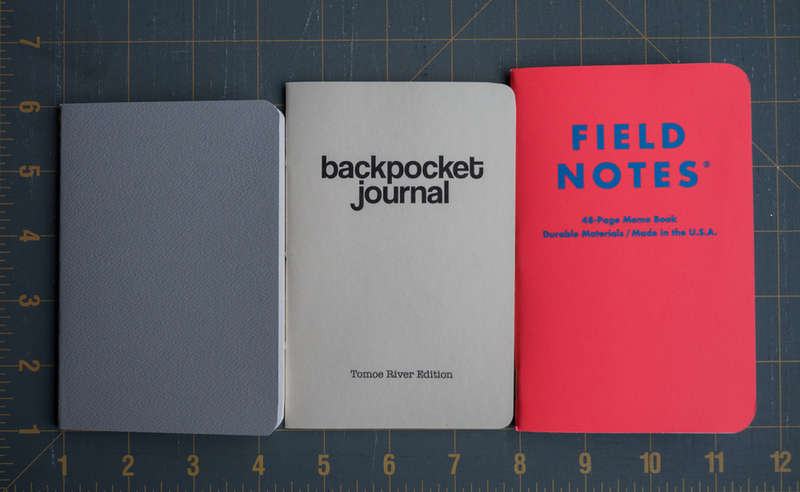 Like most pocket notebooks, the Apprentice doesn't have the nostalgic vibe that so many of us love about Field Notes. But I also love that the Apprentice isn't trying to be Field Notes. It has its own vibe. It's a minimalist vibe that puts more emphasis on what's inside the book than what's on the cover. I like that. I also really like Baron Fig the company. They are are human. They respond to customers promptly and thoughtfully. They make very nice products, sell them at very fair prices, and don't make you jump through hoops to buy them. That means something to me.